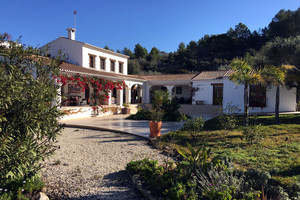 Spanish Property Sales offers you an incredible selection of properties for sale in Benissa so you can live surrounded by pleasure and comfort. We have more than 60 different models to find the house of your dreams on the Costa Blanca North. Benissa is a beautiful city in the north of the province of Alicante, which includes many qualities to enjoy a long period of rest and fun. Benissa is located in a perfect area to enjoy the sun and the sea. The climate here is very warm. Their winters are usually short, with mild and pleasant temperatures. Their summers are very hot, getting to last until the beginning of October. Benissa Costa is the maritime zone of Benissa. It is composed of exotic beaches of crystal clear water and fine sand. Its distance from the urban center is very scarce, so you can quickly move to its best-known beaches. If you buy one of our farms in Benissa, you can enjoy spectacular views of the coast. If you love the natural landscape, you can enjoy an amazing maritime panorama. Our farms are offered to the customer for enjoyment at any time of the year. You can invite your friends to cool off in your pool or relax reading on your terrace while you contemplate a beautiful landscape. All this, in a cozy natural environment. As we know that it can be difficult to opt for one or another farm, our professionals will advise you the best option for your happiness. We will take care of knowing your tastes and your needs so that your investment is as rewarding as possible. We are convinced that offering you a quality home, in a quality city, your well-being (and that of your family) is guaranteed. If you have taken a look at all our select range of properties for sale in Benissa and you have noticed some of them, do not hesitate to contact Spanish Property Sales. Our estate agents in Moraira will help you from the first moment to adapt perfectly to your new home. Our professionals will attend you superbly and solve all your doubts. We will not delay in answering your email.